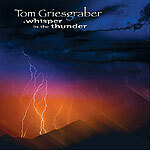 CD review: "A Whisper in the Thunder"
This review first appeared in the Winter 2004 issue of Turbula. Tom Griesgraber grew up playing guitar  like many American kids over the past half-century. His talent took him all the way to the renowned Berklee College of Music in Boston. But then he discovered the Chapman stick  which is like a guitar on steroids. Not only is the technique completely different (the fret board is held vertically, for starters, and then there are the 12 individually played strings), but it looks more like a sitar than anything familiar to American audiences. And how many people have even heard of the Chapman stick? The instrument was only invented in 1969, after all. Still, to judge by the results of his first album with the new instrument, Griesgraber's move is one that is paying off musically. With the Chapman stick's ability to be played with both hands simultaneously, it allows for the complexity of music a piano can provide but a standard guitar just can't. On "A Whisper in the Thunder," Griesgraber takes full advantage of the technical possibilities of the Chapman Stick, producing lush, intricate and ornate passages. The music here is instrumental, dreamy  a cross between new age and ambient. There are elements of world beat and electronica, chill and old Windham Hill. It's a nice listen, and on the more uptempo numbers a real joy to hear Griesgraber put that stick through its paces.